Wishing everyone a Happy New Year, Neill takes a look back at the highlights of 2016 and shares memorable moments in the life of a luxury florist in Belgravia. While the almost manic buzz of Christmas and the New Year is just settling at the Belgravia boutique, in no time at all Valentine's Day is upon us and it's time to set up our famous Valentine's installation. Last year was no exception. The larger-than-life heart, created with fresh foliage. berries and red and pink Carnations, was the special spot in Belgravia where lovers gathered to take their photo. This romantic decoration is always one of the highlights of our year, alongside the ever-increasing number of bouquets and arrangements that fly out the door - and through the heart ! - for Valentine's Day. Not everyone wants to offer their loved ones our exceptional long-stemmed Red Naomi Roses for Valentine's Day. Roses of all colours are also popular and last year we started a special weekly delivery of stunning scented Roses which were particularly successful for Valentine's Day. Our wide range of Damasque scented Roses, exclusive to our Belgravia boutique, offer an absolutely divine perfume and the charm of the old fashioned garden Rose. Damasque Roses being picked for Neill Strain Floral Couture at the farm in Kenya. In addition to adding these special Roses to our portfolio, I am constantly looking for new breeds and varieties of flowers and plants to offer our discerning clients, such as these glorious trailing Cymbidium Orchids which proved a favourite last year. Trailing Cymbidium Orchids in beautiful containers at Neill Strain Floral Couture, available in white and shades of purple and plum. In early spring, Tulips are undoubtedly one of my favourite flowers and combining a visit to our growers with a visit to the Koekenhoff Gardens is always a treat. The Koekenhoff Gardens offer the most extraordinary display of Tulips and Spring flowers. In 2016 I was thrilled with my first visit to Steef van Adrichem's nursery, Anco Vanda Orchids. This was while researching rare flowers for our Chelsea Flower Show exhibition at the boutique, now another annual tradition in Belgravia. And rare flowers I found, including this 20 year old Vanda Orchid plant - the same height as me - dating back to the beginning of Anco Orchids. Some of these we were able to include in our May Orchid showcase, "For the Love of Orchids." Also during my research trip to Holland, I visited the exceptional 4 1/2 acre glasshouse of Pieter Lips at Ichtus Flowers, both breeders and growers of cut Phalaenopsis, who provided us with many new and traditional varieties of their extraordinary Orchids. The store-front installation for our Chelsea Flower Show display is one of the greatest highlights of each year. My design for "For the Love of Orchids" was in honour of the Orchid-hunters of Victorian times who risked - and often lost - their lives to bring back new varieties of Orchids from tropical jungles around the world. This design won us an award at the Belgravia in Bloom awards, as did our design for our neighbour, Mosimann's, following the royal theme. Neill Strain's award winning design for Mosimann's at the Belgravia in Bloom competition. 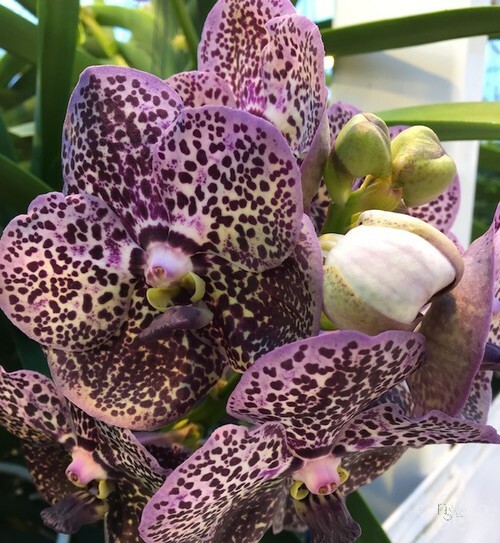 Inside the boutique, we had a magnificent display of over 40 cut Orchids as well as the rare Vanda plants up to 22 years old. Phalaenopsis and Vanda Orchids on display at Neill Strain Floral Couture during the Chelsea Flower Show. We collaborated with our lovely neighbour, Rococo Chocolates, who dipped our edible Vanda Orchid petals in delicious dark chocolate for our "For the Love of Orchids" guests to enjoy. Before and after the Chelsea Flower Show, we are often asked to design gorgeous gardens for our city-dwelling clients around London. In 2016, I had the exciting project of designing a "sky garden" for a new property construction of luxury apartments in Chelsea, called "Chelsea Island." The construction will take at least another year to complete, but here are some of my drawings of the design. The summer passed with much home styling for our Middle Eastern clients and all too soon it was Autumn, and with it Halloween, Thanksgiving and a new seasonal installation at the Belgravia boutique. Autumnal installation at Neill Strain Floral Couture London in Belgravia. I simply adore Autumn flowers and so creating floral designs with pumpkins, gourds, seasonal foliage, berries and the exquisite Autumn flowers such as Dahlias is yet another highlight in my year. Which brings us to Christmas... the busiest and most exciting time of the year for us. We will soon find out if we have won an award - or two - at the Belgravia Awards for our Christmas Window Display, as we did in 2015. "The World's Most Expensive Christmas," filmed in 2015 and featuring our lavish displays for a client, aired again on Channel 4. We enjoyed an exceptional Christmas season with even more homes to style, bespoke Christmas trees designed and decorated, our gorgeous gold reindeers, several workshops of our luxury wreath making and we virtually sold out of all our fabulous decorations. So may I now take this opportunity to wish all our clients, friends and followers a very HAPPY NEW YEAR, but also to thank you so much for your continual support throughout 2016 and I look forward to sharing yet another fantastic year of flowers and design with you in 2017.